The morning after the storm, Chris wakes up in his room, which he shares with his younger brother, Kevin, and it’s decked out in full-on 80’s gear to get your nostalgia senses tingling. 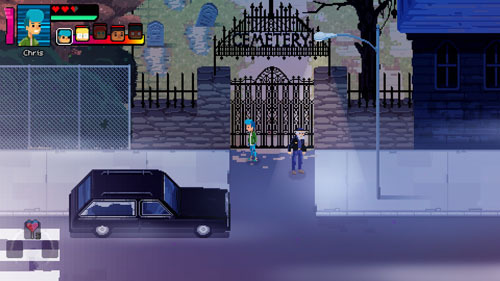 In the opening few minutes, you’ll see references to Ghostbusters, Michael Jackson, Pac-Man, Space Invaders, The Thing, Beverly Hills Cop, Gremlins and the 4-color memory game, Simon (although there are also several non-80’s references later in the game, which are ill-fitting). Kevin even has an NES hooked up to the TV in his room and comments that he and his brother were recently playing Boy Icarus, referring to Kid Icarus, but the game got messed up because of the electrical storm. Along with these items meant to establish the time period, there are lots of things designed around adding a bit of flavor to Chris and Kevin as individuals. Their room has baseball posters and trophies, emphasizing Chris’ interest in baseball, as well as typical 80’s boys' room stuff like a poster of the Space Shuttle, dinosaur toys, and a toy robot. As Chris wanders around the house, he enters his parents’ room and a storage room with some of his grandfather’s old things, including a military uniform, medals, and a photo of him with his platoon. Chris comments on the items he encounters, giving some additional context to his life and the people that he cares about. 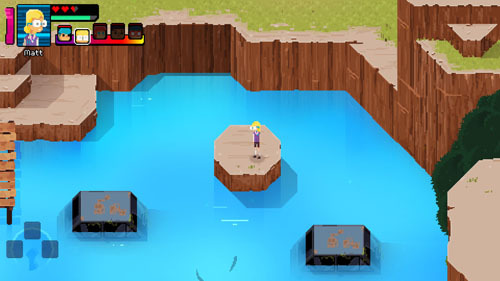 These bits or characterization are important as Chris and his family (and his friends) find themselves in peril later in the game. Chris also interacts with his parents directly, and they ask him to track down his little brother who has gone off on his own again. The player also learns that the family dog recently passed away, and that Kevin took this particularly hard. 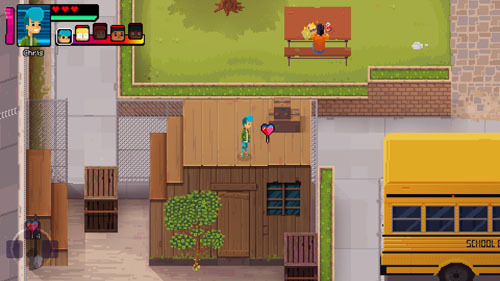 After playing a bit of baseball with Chris’ dad – which acts as a combat tutorial – the player is free to wander the town as he makes his way to find Kevin at the kids’ hideout. 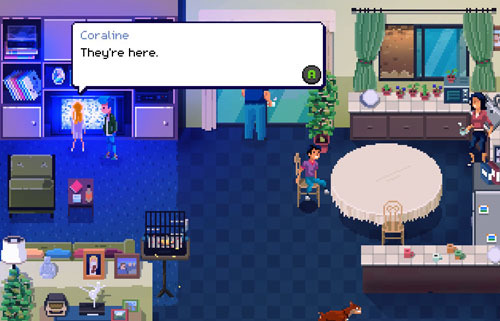 Here, you’re able to wander into different houses in the neighborhood – one of which is just a huge Poltergeist reference – and talk to people in the neighborhood. Along the way, you’ll enter your local comic book shop with a few references to popular superheroes, Invaders Arcade which is modeled after Flynn’s Arcade in Tron and features references to a few popular arcade games and even the Devolver Digital-published Mother Russia Bleeds, and a movie theater featuring Snake, a film modeled after Stallone’s Cobra, with movie posters referencing The Fly, Critters, Short Circuit, Top Gun, and Stand By Me (which is humorous given that the kids start the game by going to look at a dead body). 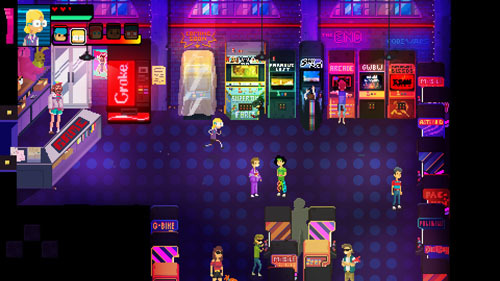 Soon, you begin running into Chris’ friends, each of whom has different personality traits, and each becomes a playable character that may be cycled through any time. Each character has his or her own stamina meter and health meter, with different amounts of max health. Every action the player takes drains a stamina meter a bit, and this meter refills quickly on its own. Characters can attack in any direction while on the move or lock themselves in place to aim freely around them. As you meet each of the kids and major NPC’s, corresponding character profiles appear on the pause screen. 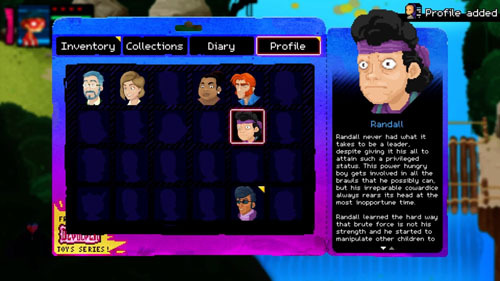 This interface also contains the player's inventory, a quest log, and a list of optional collectibles in the form of VHS tapes, audio cassettes, and NES games, each of which offers a reference to 80’s pop culture. Chris is the athlete of the bunch and he uses a baseball bat as his main weapon, which he can swing for a 3-hit combo at a decent range, and each swing depletes a bit of stamina. He can also jump and perform a medium dodge roll, and his special ability allows him to climb vines to reach areas that the other characters cannot. He has three hearts in his life meter. 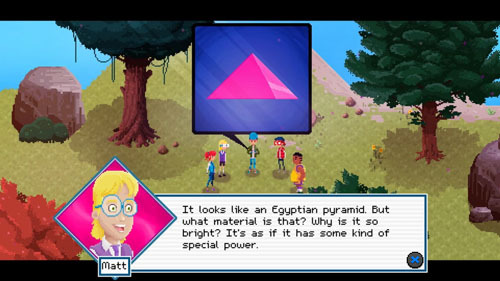 Matt is the geeky kid who knows way more about science than any kid ever could (a typical archetype in 80’s sci-fi), which allows him to create laser weapons, manipulate devices to function beyond their intended purpose, and even construct a device to harness the power of the mysterious pink stone. Instead of a jump, he has a jetpack that he can use for a short range until his stamina depletes, allowing him to cross larger gaps than the others. His dodge roll lets him scoot along on jet skates. Matt has a laser as his weapon (which he invented himself) that continuously fires weak shots but lets him hit targets at a distance, and even hit otherwise inaccessible switches. 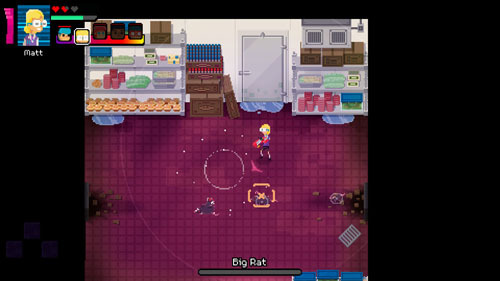 He can also create a ring around him that lets him auto-lock on the nearest target, which is useful when taking on lots of weak enemies in succession, like the spiders and rats in the opening areas. He has 2.5 hearts in his life meter. Big Joe is a heavy-set kid who attacks with his fists, doing heavier damage than anyone else in the group, but his running speed is slightly slower. He has a 5-hit combo with a big uppercut at the end, but his attacks use up stamina more quickly than the others. He has a long slow dodge roll, a small explosion instead of a jump, and he can push and pull heavy things, setting up a lot of box-pushing puzzles later in the game. He has five hearts in his health meter, making him a great choice for most heavy combat situations. Next up is Charlie, which is short for Charlene, and she is a redheaded girl who lives in a mobile home park on the edge of town. She has the most range in her attacks, using a jump rope as a whip to strike enemies with a 3-hit combo. She can dodge roll or scoot along the ground depending on which direction she is facing, and she has the ability to catapult herself across huge gaps by slinging her jump rope between pairs of posts. She also has a slightly faster running speed than the other members of the gang, making her ideal for handling fast-moving enemies and certain environmental navigation challenges. She has three hearts in her life meter. Finally, there is Kevin, Chris’ younger brother. He has the same jump and dodge roll as his brother, but has no offensive abilities at the start. Instead, pressing the ATTACK button has him alternate between popping a balloon, picking his nose, or farting. 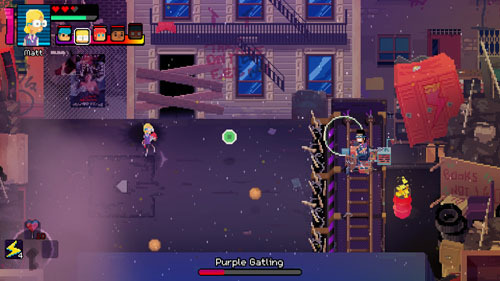 Kevin gains some new abilities later in the game based on events in the story. He has four hearts in his life meter. 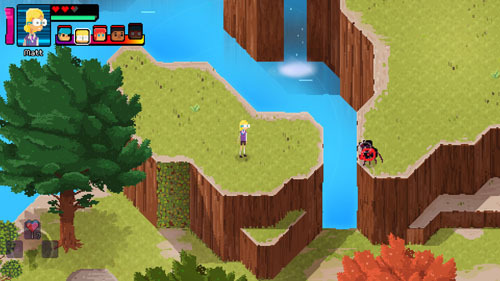 Players are given plenty of reasons to swap characters during the course of the adventure in order to make use of each of their strengths to solve environmental and combat challenges. Some characters have unique comments when interacting with things in the environment to provide some additional detail about their personality or expertise. Since each character has his or her own life meter, you can also swap between them when one character’s health is low. Getting a character killed doesn’t give you the ability to swap over to another, however, but rather sends you back to the most recent checkpoint, and some of these are spread out quite far. 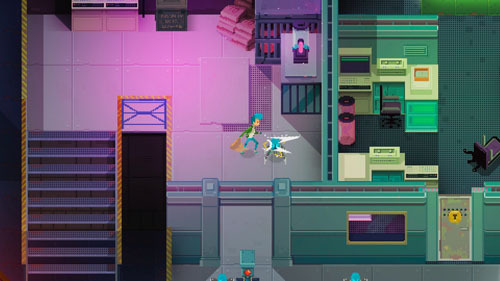 Health restoratives are uncommon, with enemies and destructible objects occasionally dropping hearts that restore one quarter heart in your meter, with rare drops of large hearts that restore one full unit. 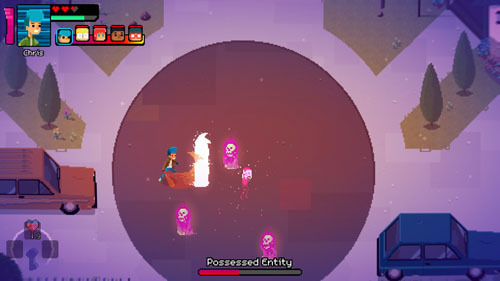 Players can also break open chests to find candy that restores one character’s life meter completely, and players can stock these for later use, allowing 10 to be carried at a time. 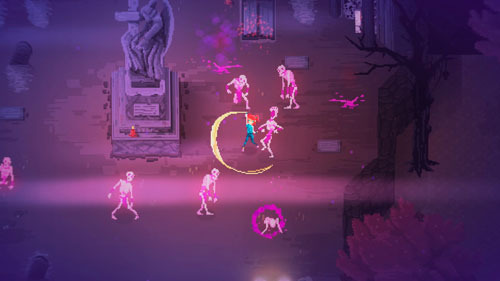 Players also discover lightning bolt pickups that let them stun onscreen enemies, allowing them to get in some free strikes. 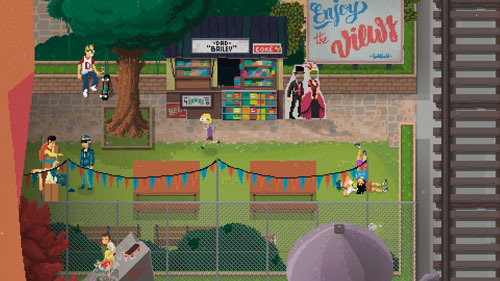 The game world is made up of chunky yet detailed sprite art, with some nice little animations to offer additional character. There are some cute animations tossed in for fun, such as unique idle animations for each character that speak to what makes them unique. For instance, Chris poses with his bat while standing still while Matt engages a jetpack that temporarily burns him to a crisp in a cartoony fashion. Early in the game, Matt creates a device that allows the group to power the stone and see into the world of the dead. The kids discover this ability by accident as they begin seeing ghostly cavemen, cowboys, and even monstrous creatures all around them. 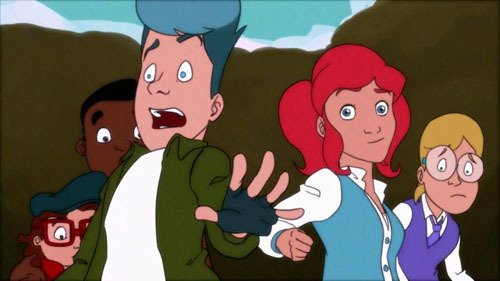 The kids must move between realms in order to combat enemy creatures and even interact with ghosts to complete their journey… but they also discover how dangerous the stone is, as it can drain the life of anyone using it unless it is powered by an outside source. The power of this mysterious stone sets up much of the peril later in the game when some kind of covert government agency quarantines the town and tells everyone that there has been a viral outbreak. The kids then find themselves trying to sneak around these government agents, occasionally taking them on in boss-style encounters, in order to save their families. There’s a healthy dose of E.T. 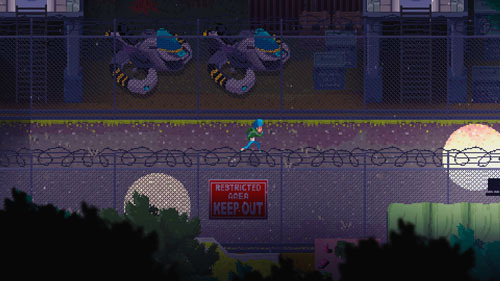 here as the kids traverse walk-through tubes connecting buildings, dodge the watchful eye of agents, and even outrun pursuing agents on their bicycles. 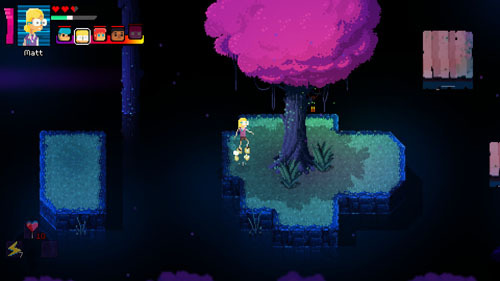 The player does direct combat with a number of creatures and human characters, and also must complete platforming challenges and solve quite a few environmental puzzles. A couple of these challenges are a bit drawn out, but most are not overly difficult. 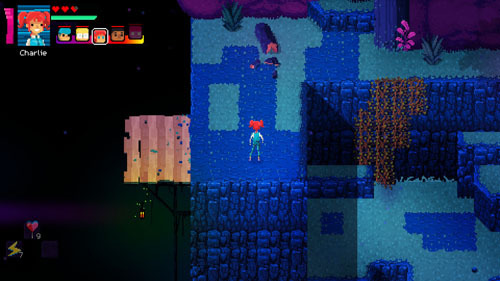 The ability to swap characters and carry a large stock of healing items can help you get through the toughest combat challenges, whereas platforming and puzzle solving are not terribly complex, with most solutions being obvious, and the occasional bit of trial and error will see you though most other situations. As such, the game is mostly narrative-focused, and the game embraces this with a strong storyline and excellent characterization. 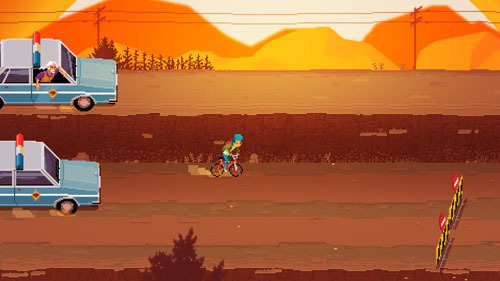 Crossing Souls was developed by Fourattic, a studio based in Seville, Spain and founded in 2012. 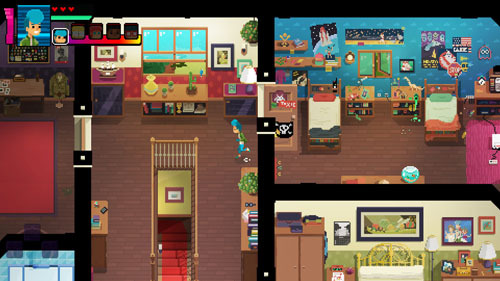 The studio previously developed Odd Pic Out and Pixel Puzzle Mania on mobile devices. 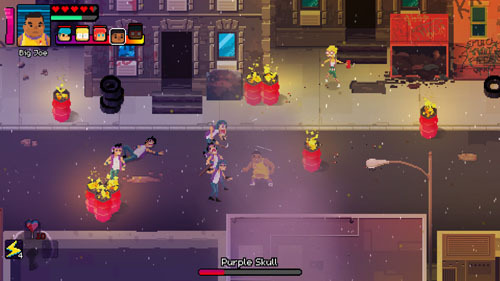 The game was published by Devolver Digital, which has published a number of 2D indie games including Serious Sam: Double D XXL, Luftrausers, Broforce, Foul Play, Fork Parker's Holiday Profit Hike, Hotline Miami, Hotline Miami 2, Titan Souls, Not a Hero, Ronin, Downwell, Enter the Gungeon, Mother Russia Bleeds, Serious Sam’s Bogus Detour, Minit, The Swords of Ditto, and The Messenger.